Our Bridal Handcrafted White Pearls & Clear Crystals Pearls with cubic zircon surrounded Necklace Set. Custom Jewelry are made with Swarovski Collection & latest style & upcoming designs. 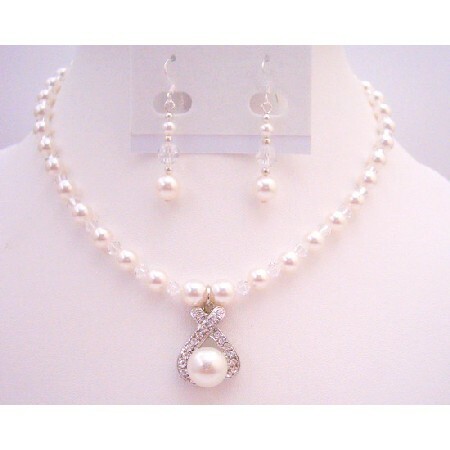 This is very beautiful delicate sleek & elegant Necklace Set made with Swarovski White Pearls & Swarovski Clear Crystals with Pearls Pendant surrounded with simulated Diamond. Sterlig silver Earrings. Buy Pure Whie Pearls Jewelry w/ Clear Crystals Drop Down Pendant Set , sold & shipped by Fashion Jewelry For Everyone where you can shop online for Leading Online Retailer for Indian Fashion Jewelry. This Necklace Sets collection has been tagged as Pearls Jewelry,Pearls Crystals,Pearls Pendant,Pearls Set,Jewelry Set,Clear Jewelry,Clear Crystals,Clear Pendant,Clear Set,Crystals Pearls,Crystals Jewelry,Crystals Pendant,Crystals Set,Drop Down,Pendant Jewelry,Very,Pure,Whie.